Malolactic fermentation (MLF) can be one of the most problematic areas that a winemaker has to manage. The advent of commercial preparations of bacterial cultures for MLF has both simplified and improved this difficult area. Research is ongoing on MLF and the results of this work is helping to further improve these preparations and thus helping to make MLF less troublesome. Along with D-tartaric acid, L-malic acid (malic acid) is the other major acid to be found in grape juice. Other acids such as citric acid and acetic acid can also be found in juice in smaller amounts. Of the major acids malic acid, unlike tartaric acid, can undergo fermentation by certain bacteria commonly found in wine. The group of bacteria that are able to perform this fermentation are known as the lactic acid bacteria (LAB). The LAB most commonly implicated in MLF is Oenococcus oeni (formerly known as Leuconostoc oenos). As can be seen from the above equation, malic acid contains 2 carboxylic acid (COOH) groups whilst lactic acid contains one. One of the major effects of MLF is to de-acidify wine that undergoes this process and thus increase the pH of the wine. Another effect is the evolution of carbon dioxide from the wine during MLF. Using MLF is generally a deliberate decision by a winemaker, although this is not always the case. MLF is generally regarded as more difficult to manage than the primary yeast fermentation. Recent advances in winemaking technology and products have made MLF more manageable however from our experience it is not always plain sailing. As MLF produces CO2, a simple way to confirm that MLF has started or is underway is to check for the evolution of CO2 bubbles. When MLF is occurring in barrels this can be relatively easy to observe. However MLF can often be very slow and so the formation and evolution of CO2 bubbles is so slow as to be hard to observe. A more definitive technique for monitoring the progress of MLF is to measure the pH of the wine. The change in pH (due to the deacidification reaction) can be measurable. However sometimes the pH change is not large (0.1 to 0.2 pH units) and can occur over a long time period if the MLF is slow. This factor, along with the difficulties of maintaining and calibrating pH electrodes means that this technique also has limitations. The lactic acid produced in MLF can be measured directly by techniques such as thin layer (or paper) chromatography or enzymatic analysis. 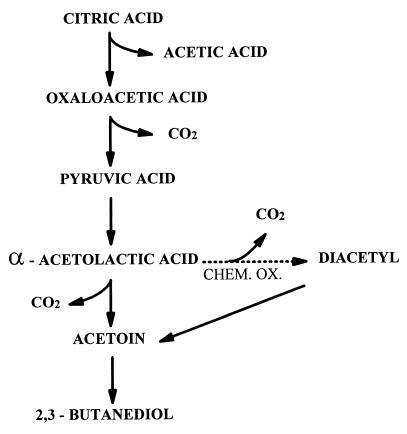 Although this can be useful, it is not as useful as employing these same techniques for measuring the other main metabolite in the fermentation, that is malic acid. The main benefit of employing MLF is to produce a wine that is stable. This pertains particularly to red wine where the impact of LAB is less easy to manage than in white wine due to the lower efficacy of sulphur dioxide as an antibacterial agent in red wine. Of course as MLF is a deacidification process, this can also be used to deacidify wine. MLF is used in some countries and regions for this purpose, although it doesn’t appear to be used much for this reason in Australia. Another benefit of MLF is to cause flavour changes in the wine. One of the major flavour compounds that can be produced is diacetyl (1). The flavour of diacetyl is a buttery, butterscotch, nutty one. This flavour profile whilst once widely favoured in some varieties, especially Chardonnay, is less popular nowadays and is not necessarily considered a benefit of MLF by some or indeed most winemakers. The process of diacetyl formation deserves some attention due to this impact. The threshold values of diacetyl vary between wine varieties but are typically in the 1 ppm range (Ref #1). 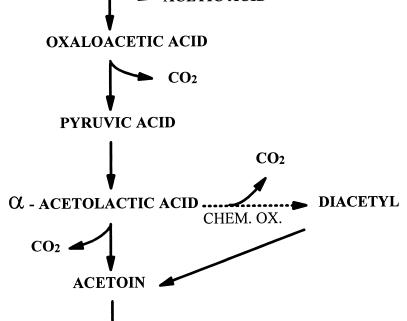 Recently strains of Oenococcus oeni have been made commercially available to winemakers so that the diacetyl flavours in wine do not appear (for example MaloBacti CN1 available from Vintessential). These strains are known as Citric Negative strains and do not degrade the citric acid and so do not form diacetyl, thus avoiding the buttery flavours. The LAB used for MLF are quite temperature sensitive, much more so than the yeast used in the primary fermentation. The temperature range recommended by most suppliers of bacteria for MLF is from 15°C to 25°C. As the bacteria are very sensitive to temperature it is important at all times to keep the wine undergoing MLF within the range recommended for the particular strain used. Again for the best results with commercial strains of Oenococcus oeni it is best to follow the manufacturers’ recommendations as the minimum pH does vary by strain. The minima are typically from 3.0 to 3.4 whilst the maximum value is not of concern as the normal pH encountered in wine are all well below any maximum that might inhibit the growth of the bacteria. As sulphur dioxide is an antibacterial agent, the level of sulphur dioxide is another important issue with MLF. Again the recommendation by different suppliers varies, but a typical guideline is for a maximum of 50 ppm total sulphur dioxide. Of course it is important that this is measured accurately and it should be measured just prior to inoculation. Results of testing performed much earlier in the wine’s life should not be relied upon as the yeast in the primary fermentation can also produce sulphur dioxide thus adding to the total amount present. Malolactic fermentation is a part of the winemaking process that is one of the most difficult to manage well in all circumstances. The advent of commercial preparations of MLF bacteria has made this easier, but is by no means foolproof. New advances in the application of commercial strains are helping to improve the ease of MLF management. Understanding the basics of both the chemistry and microbiology of MLF is the key to avoiding problematic malolactic fermentations.